The second edition of this acclaimed text has been fully updated and substantially expanded to include the considerable developments (since publication of the first edition) in our understanding of the science of climate change, its impacts on biological and human systems, and developments in climate policy. 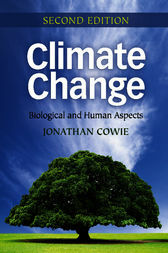 Written in an accessible style, it provides a broad review of past, present and likely future climate change from the viewpoints of biology, ecology, human ecology and Earth system science. It will again prove to be invaluable to a wide range of readers, from students in the life sciences who need a brief overview of the basics of climate science, to atmospheric science, geography, geoscience and environmental science students who need to understand the biological and human ecological implications of climate change. It is also a valuable reference text for those involved in environmental monitoring, conservation and policy making.